This is the way I like the water. 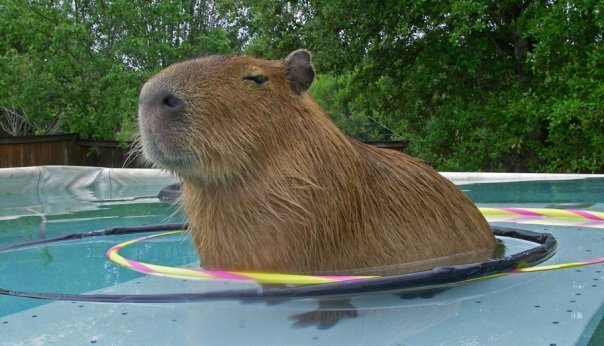 My owner cleaned my pool this weekend. This is always stressful for me. It involves one or two days when I cannot go swimming and I hate that. In fact, I do not know why she insists on doing it. I like my water thick. What’s the problem? But she said she won’t swim with me once it gets too green so I guess it has to be done. I'm not commenting on why the water is brown. While my pool was empty, I had to make due with a little wading pool. 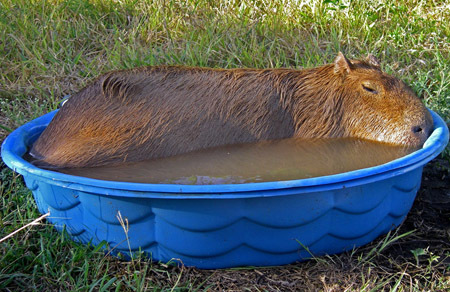 Seriously, does this look appropriate for a 100 lb capybara? Standing on my pool table in the newly cleaned pool. Afterward the pool was crystal clear. Apparently that is good for photography. 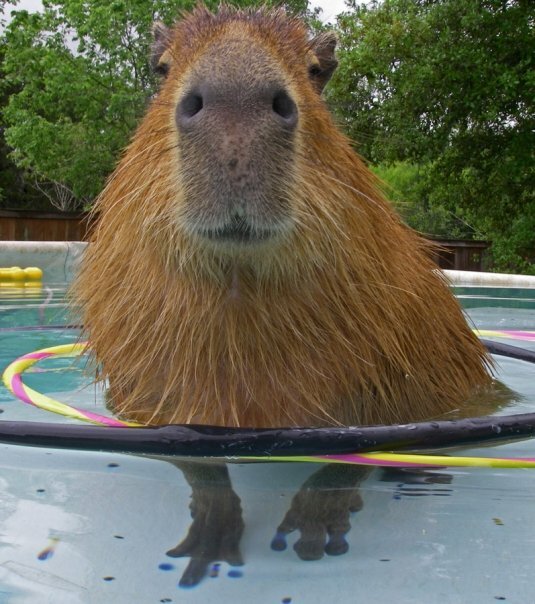 But look, you can hardly even tell that my paws are underwater in this photo. The whole event reminds me of a rather embarrassing incident that happened a long time ago. I was going to post this earlier but, well, I was a bit ashamed. 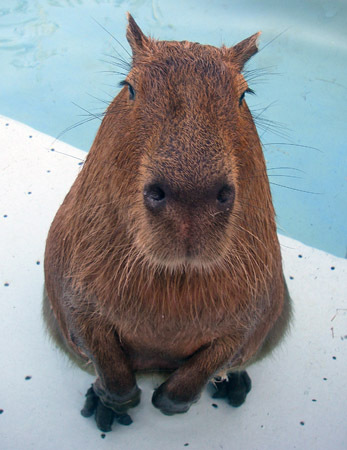 I’m almost a full-grown capybara but sometimes I still act like a baby. 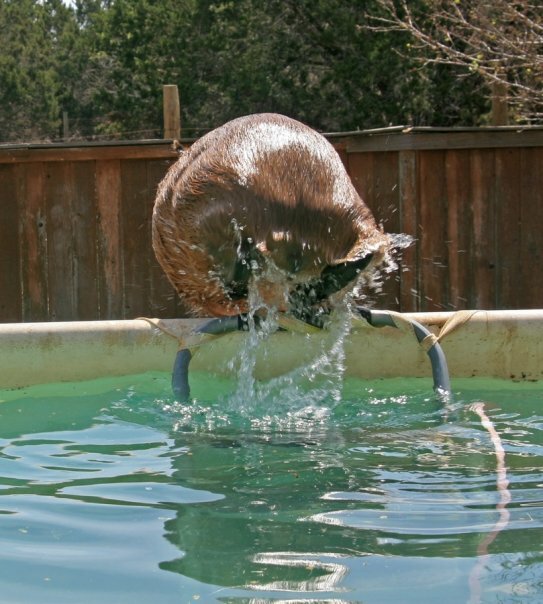 That’s what happened last weekend when my owner decided to clean out my pool. My pool had been getting dirtier and dirtier over time. That was fine by me. I like dirt. I like my water with a little texture and color to it. But my owner and Rick don’t. They think the water should be crystal clear. Since I stopped pooping in it a few weeks ago, they think they can keep it clean. So I guess I set the whole thing in motion for my own embarrassment. 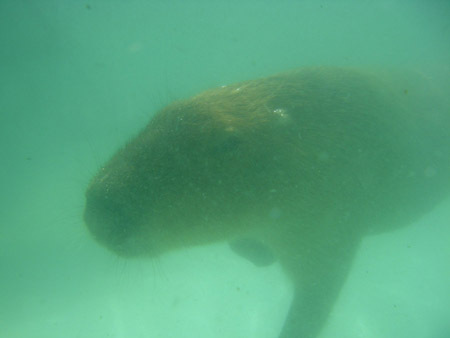 Last Saturday I took my usual morning swim. Then my owner and Sheldon took me for a short visit to the vet. I’ve been having some swelling in the area formerly occupied by my testicles and my owner was worried. I was hopeful that I was re-growing a new testicle, which would have been nice. Neither one of us was right, it turned out to be just a fatty deposit and nothing to either worry or get excited about. 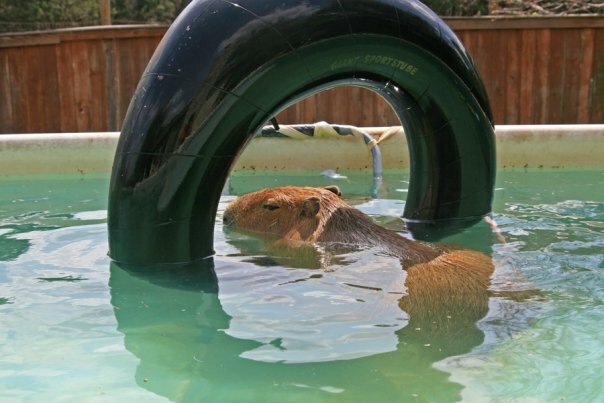 While I was at the vet, Rick drained my pool! When I got home, there was no pool to swim in at all. The stack of hay that normally leads up to the edge of the pool had turned into a stairway to nowhere since the side of the pool pulled several feet away as it lost the pressure of the water against it. When my owner saw that Rick hadn’t taken down the haystack, she went over and knocked off the top bale of hay. Rick said she didn’t have to do it because there was no way I could jump into the pool across the big gap. My owner said it was better safe than sorry so she did it anyway. 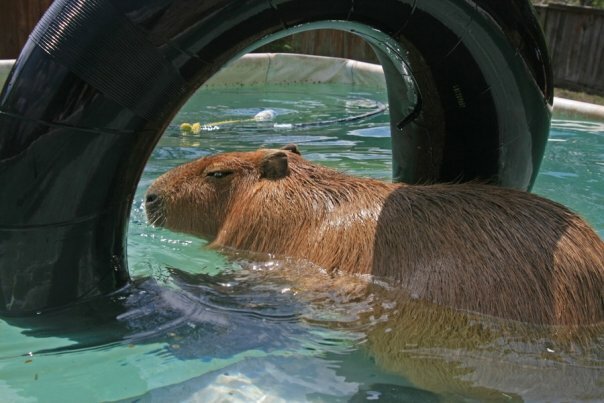 After that my owner started spending a lot of time in my pool getting the last of the water out and scrubbing the walls. I mostly grazed around the outside but two things bothered me: why couldn’t I go swimming and why couldn’t I be with my owner? I didn’t like it. Sometimes I climbed on the hay and eeped at her. She’d come and lean over to give me a treat and scratch my nose. It wasn’t enough, I wanted more. On Sunday when I realized my owner was going to spend hours in the pool without me AGAIN, I decided to do something about it. I waited until she was scrunched down at the bottom of the pool and not watching me. Then I climbed up the hay and looked across the gap. It was about two feet up, three or four feet over, and then four feet down to bottom of the pool and I would be reunited with my owner. I took a deep breath, gathered myself up and made the spring of a lifetime. 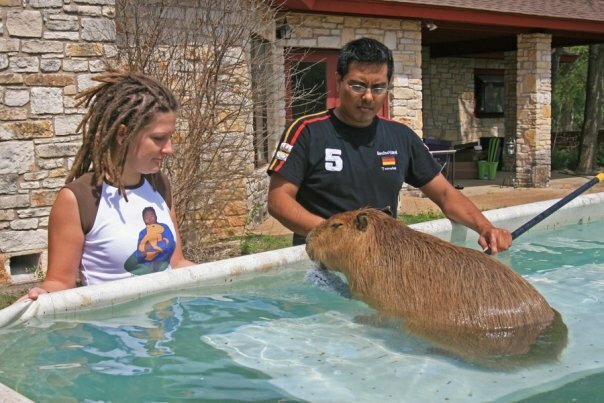 Some of you may not know this but capybaras are champion jumpers. I don’t think my owner knew it either. You should have seen her face when she saw me flying through the air! Ha! I was as graceful as a swan, at least at first. Then I hit the ground and bumped my nose, then rolled across the floor of the pool. Ouch! I hit my head. But I got on my feet quickly and started running around. All the water was gone, just a small puddle in one corner. We had another problem. I didn’t really like being in the empty pool. I started running around and eeping. But I couldn’t get out! There was no water and they’d taken my steps out anyway. Eep! Eep! It was scary in there. My owner said she couldn’t pick me up because I’m too heavy now. She traded places with Rick but he couldn’t pick me up either. 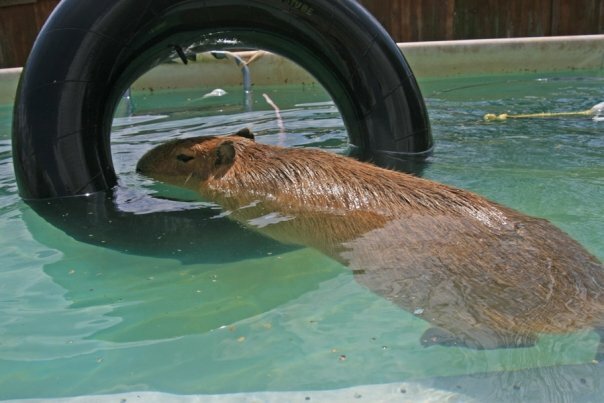 Finally they had to throw some bales of hay into the pool and I climbed up those and got out. My owner grabbed me and helped me down so I didn’t land too hard. 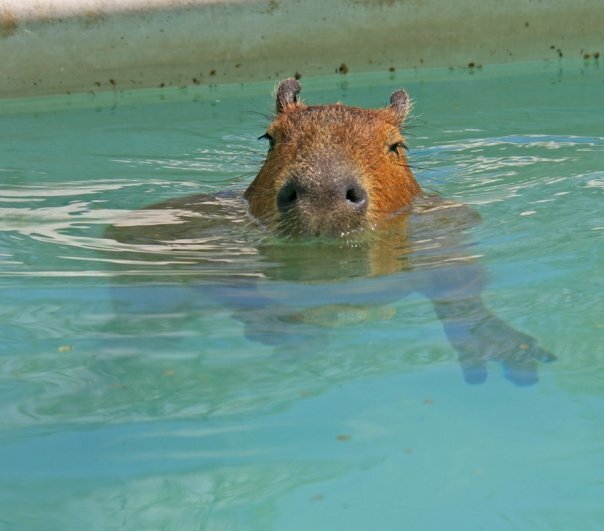 I guess we all learned an important lesson…capybaras can jump!